Tan is easier to remove when its fresh! Once it gets older, it becomes quite difficult to get rid of it and one may have to go through chemical peelings or other similar expensive chemical processes.. DESCRIPTION: POND’S WHITE BEAUTY, Sun Dullness Removal Facial Scrub, with TanSolve beads and 50% brightening cream, this foaming cleanser gently scrubs away the surface skin cells that have become dull( from dirt, dust ,excess oil) to reveal beautiful fairer looking skin. COST: INR190 for 100g, INR110 for 50g. HOW TO USE: Wet your face, create lather, gently massage onto face and neck, then rinse off. Myristic acid, glycerin, water, propylene glycol, potassium hydroxide, palmitic acid and stearic acid, lauric acid, glycol distearate, decyl glucoside, glyceryl stearate, hydrated silica, poluquaternium 7, dmdm hydantoin and iodopropynyl butylcarbamate, Titanium dioxide, niacinamide, silicaand cl 73360, di sodium edta, perfume, linalool, butylphenyl, methylpropional, hexyl cinnamal, limonene, citronellol. STORAGE: Store away from direct sunlight and heat. WARNING: In case of contact with eyes rinse with water immediately. 2. It isn’t harsh on skin. 5. It removes TAN quite effectively. 1. It is quite drying even for combination-oily skinned beauties, so a good moisturizer becomes important after using the scrub. 2. It doesn’t remove makeup completely, but then it doesn’t even claim to do so. I will try this out – the pricing is good and i hope it will work on my skin too. Thanks for the tip about the moisturiser ! Any particular one you would recommend to use after using this scrub? Ponds has its own legacy. I love the way you described it with fullproof reviews. I will use this during summer because currently my skin is behaving dry and I can’t even imagine to use this. It seems like a great product from ponds.. I loved the way you have listed down each and every point, I haven’t tried this product yet, but it sounds interesting for sure, thank you for sharing this amazing bit will definitely like to give it a try! So you’ve prepared my summer kit right away. This sun tan scrub sounds great to me for my travel schedules. Can we use it daily? This is truly an amazing product. I used it a lot. Except for the drying part, this is a pretty good scrub. Loved your detailed review. I have tried this scrub but it made my skin dry after washing it off. It will be good for oily skin people. Yes, it dries out the skin! 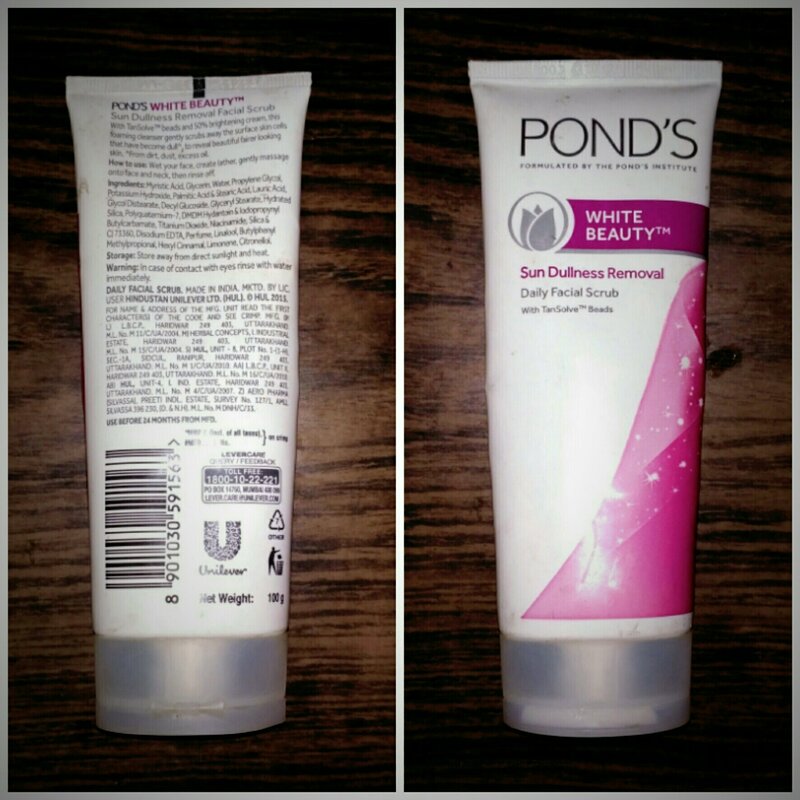 thanks for sharing the detailed review about Ponds white beauty face scrub. This seems to be a helpful product for my dull skin. I would love to try it out. Amazing and beautiful post. Pond’s is the trusted brand. Pond’s white beauty scrub sounds good for tan removal. Great thoughts. The harsh Indian summers are upon us and with it comes challenges to the skin like tanning etc. This Ponds product seems effective in combating the effects of tanning and is something that will be useful to us especially when travelling. Ponds have always been my favourite brand and this one looks very promising…will definitely try this out soon.. I loved this complete review that you have done. Ponds is a trusted brand and I don’t mind trying…My only issue is the dryness it might cause. But lemme get a good moisturiser and then go for this scrub. It looks effective and the price also wont harm your pocket will try it out specially since summers are almost here. You have given this product a very high rating but I usually stay away from all kinds of “whitening” type of products. Thank you for sharing an honest opinion though. I am yet to try out this scrub but I already in love with their anti pollution face wash. This scrub seems like a great product for tan but definitely need a nice moisturizer afterwords.